The Drifters produced a whole raft of songs which proved perennial favourites with the soul fans at Manchester soul clubs in the sixties particularly at the Twisted Wheel and the Blue Note. The Drifters are unique in soul music being the most successful in pop terms and also just the same in the Mod – Soul All-nighter ‘underground’ scene throughout the 60’s decade. Carol King wrote Up On The Roof for the Drifters, Gerry Lieber and Mike Stoller, wrote for them, Wrapped Tied And Tangled by Laverne Baker has riffs obviously related to On Broadway by the Drifters. A question of stretching out a good idea! They had hit after hit after hit. 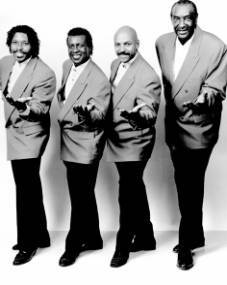 The invitations toured the UK calling themselves The Drifters and singing all the Drifters hits.I saw them on a few occasions – the Northern Sporting Club Manchester and then at the Domino Club (on Grey Mare Lane) and noted that they were too young to be the real Drifters. The Drifters were also on at the Twisted Wheel as the `Original Drifters’ but there were three separate sets of them floating around at the same time! And it was still ongoing in 2014 with a group of that name touring! ORIGINALS and ORIGINALS and The ORIGINALS – just how many Drifters were touring in the mid to late 1960’s and beyond? What about the Drifters – well what about them…? “What about the Drifters, I thought you girls liked them the most?” asked Angelo. “How do you know all this stuff?” asked Angelo, sort of amazed. Usually it was blokes that could spout such details, which were often designed to impress other Soul obsessives. “Especially so, as you got in free as well!” said Angelo. “Maybe they were the other ones with this guy, just pretending to be one of the blokes on the records.” He told her about DL asking one of the Drifters tribes to sing a request, and they turned out to be the Invitations! The Original Drifters appeared at the Twisted Wheel in Manchester on Saturday 25th March 1967 and again on Saturday 2th of April and just a couple of weeks after their original singer Ben E. King had appeared at the club. The Drifters were a rotating line up and still an ongoing money spinning one, and they get younger as time goes by! You Got To Pay Your Dues – 69 on Kev Roberts Top 500.